The truth is, life is short, none of us know what might happen tomorrow, and tomorrow is never promised. I guess analysis of reality is left to the individual. Interpretation is personal. Everyone’s goals, ambitions and desires differ. Life would be dull if we all dreamt the same dreams. What makes it colourful are people’s unique views and passions- no matter how big or small. How does your bucket list look? Rewind 3 years, maybe even less..my journey had definitely started, I’d already grown into my passions but I don’t think I had the courage, interest or even the fitness levels to hike the Great Wall of China. It’s fair to say that until recently I didn’t even have a desire to visit China. My understanding and opinions on the country were naïve, narrow minded and mainly based on under researched articles and scaremongering reviews on a country I was led to believe had many strange ethical and political issues. What I did always have though, was a curiosity around the Great Wall and a desire to learn more about it and witness its magic wth my own eyes. My new found desire to challenge myself fit perfectly hand in hand. I guess for some people hiking the Great Wall isn’t a challenge, but we all make our own challenges. To me, hiking the Great Wall quickly translated to conquering my mountain. Proof to myself that I can achieve my dreams, relying on my legs to carry me on a journey I am truly privileged to make, I am blessed with good health and a strong mind.. For me this is exactly what my bucket list is all about. What made it such a great wall? Whilst curiously asking myself this question, China quickly escalated up my bucket list and this trip became one of my most organised and planned adventures yet. They say you can see the Great Wall of China from space. I was told this isn't true at all, one of the worlds greatest space-based myths. That would make sense I guess. But then I saw it with my own eyes and naively wondered, how much of the earth does something need to occupy to be seen from up there? And then I remembered what a small proportion we are of this ginormous universe, if even China herself didn't produce something grand enough. Her stories came close though. A wall built by an army of emperors, soldiers and common people to protect her beautiful heart and rumoured to be seen from another galaxy. Impressive. Arriving for the first day of hiking on the Great Wall, I was super excited. By now I was well versed and settled into Chinese culture. A few Chinese words to get me by (very few! ), chop stick skills reperfected, a new found immunity to the intermittent smog, I guess I was as ready now as I’d ever be. Until you actually see the Great Wall, I think you underestimate it. I’m of course generalising, I can admit that I most definitely did. Unless you see it and explore it with your own eyes, ears, nose and feet it’s easy to assume the wall is pretty, restored and in mint condition. The snippets of wall you see in fancy travel magazines and on TV programmes is a mere tiny weeny snippet of the truth.Today the wall roughly stands at 21,000kms long and even still they find parts they didn’t know existed. 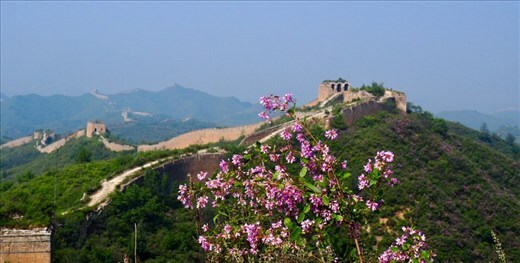 The first day of hiking was scheduled on the famous Mutianyu section of the wall, located just north of Beijing. So, from memory (I’m not claiming exact facts! ), the Mutianyu section of the Great Wall is one of the better known pubic sections. It is extremely well preserved and offers walkers the opportunity to hike up to 20 watch towers over the dazzling and splendidly restored wall involving a relatively easy walk and safe climbs. There is even a cable car and toboggan option for those less mobile and a large range of stalls and restaurants in order to provide a really comfortable, but not so authentic experience, and honestly, a pretty nice way to break in our walking boots. On completion of the 20 (ish) restored towers, I can’t recommend enough that if you are capable of challenging yourself onwards to watch tower 27, the true peak of this section of the wall then you will be seriously rewarded.Beautiful, peaceful, meandering wall, filled with overgrown wild flowers, surrounded by butterflies and enveloped in crumbling rocks. The walk isn’t easy, often steep and dangerous, a few passers by in the opposite direction appeared pained but encouraged us to keep going. At this point, maybe hour 5 or 6 of hiking and at least an hour in to the difficult hike, I was not only in absolute awe of the sheer vastness and almost gothic like beauty of the wall, but I was also sweating, huffing and puffing and wondering what on earth I’d actually let myself in for.That day the weather was perfect. The end of Summer, heading into Autumn meant cool mornings, crisp, warm middays in the sun and low humidity. My eyes fiercely indulged in the exhilarating views from the top of the watch towers, the wall meandering off effortlessly over the hills, as far as the eye could see. This day was so clear, we could see the towering buildings of Beijing hovering on the horizon, a rarity I believe in Beijing’s infamous humid and smoggy atmosphere. Tower 27 will see you at the genuine peak of this section of the wall. I could guess that Mutianyu is the easiest part of the wall to visit which also offers the opportunity to 'get off the tourist track', just hop over that wall when you think you've got to the end and keep going! However, do be careful. Obviously this part of the wall is not signed as open to the public for a reason, its dangerous! Day 1 of hiking and the stunning views across the Chinese countryside, and the massive sense of achievement took my breath away. This was the very beginning of my appreciation of the raw beauty this wall stood for, both literally and metaphorically. The following day our hiking took us to Jiankou. Jiankou is a quaint village with a handful of houses and a spectacular view. Nestled under the Chinese country side with the wall lining the rolling hills across the lazy horizon. I was excited to walk on the wall at sunrise and a ridiculously early wake up call paid off. Autumn mornings in the Chinese countryside were dark and damp and trekking up steep inclines seemed like I'd never reach the top. Soon the sun started to poke out over the peaks, glinting and reflecting over the watch towers. This part of the wall wasn't open to the public and we sat in silence in awe of the emerging morning over the hazy stone wall. This time of the day just emphasized the walls pure and mysterious beauty. You could not only see it but almost feel it too. If I thought the wall couldn't surprise me anymore, I was wrong. If you're visiting then hiking at sunrise and in the early morning, atmospheric haze is an absolute must and Jiankou can offer you the absolute perfect, mystical spot. The Sleeping Dragon and Crouching Tiger sections of the wall are both beautifully bewitching , unrestored spots of the wall, providing seasoned hikers with challenging climbs up crumbling ascents and stunning, diverse views combining rolling hills, train tracks, villages, rivers and of course a completely undisrupted enjoyment of one of the worlds most famous man made constructions. Don’t underestimate the Great Wall’s gritty and dramatic beauty. China is like no other Asian country I've been to. It has this interesting sense of eclectic freedom you can feel in the locals friendly laughs and intrigue in tourism, yet it is mixed with a strange communist undertone so evident still in the lack of social media. I wonder if its a form of patriotism, the severe lack of English and accounting for any type of western culture, however..I'm informed in good faith that it is more to do with the Economy and protecting the country from outside advertising. Seems strange, but who knows? and who am I to judge? I am merely a visitor, learning about their culture with a naïve lack of understanding. My main purpose for visiting China was to hike the Great Wall, but China really does have so much to offer. Drink tea, plenty of it! Oolong tea to be precise! Eat dumplings… Millions of them. Browse the old traditional Hutongs. Don’t miss getting your history fix at the Forbidden City and Tiananmen Square, the picture perfect Summer Palace or stunningly famous Temple of Heaven. Eat homemade noodles and surprisingly spicy hotpots, visit a traditional medicine man and try fire cupping and brush shoulders with the artsy crowd at district 798. I suppose its easy to ramble on when you feel passionate about something. I guess until you walk it yourself, a wall is a wall?